She tries to stop RK n says. all will end. he cant do this n RK says..today she wont stop him n walks down and Madhu chases him..! Madhu asks Radha to stop RK .. n asks her how can she see one brother killing another?! RK stops in his tracks! RK asks what? That guy is his bro? Madhu says.. Sultan is RKs brother! MKs son.. n RK says. .this is a lie..
RK says wont believe even if the world says.. ! Madhu asks Radha to tell the truth…! Radha is mum n RK asks Radha what is it she wants to tell him? RK asks Radha all this is lie right? Sultan is not his bro? All this is lie say ..it .. he screams n Radha breaksdown.. n RK is stumped! He looks at the newspaper n then the gun ..n gets up .. ! 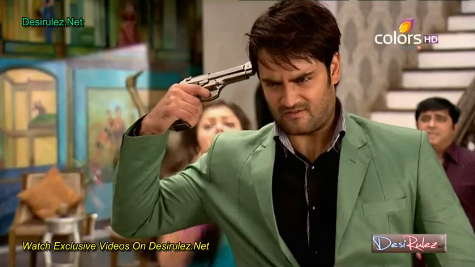 He puts the gun on his forehead and Madhu is shocked All scream no. .n Madhu moves the gun away..n bullet is fired in the air..! Madhu asks if he is nuts? RK says. .coz his wife n mom are making him believe the worlds biggest and dirtiest lie! He asks Radha again..! He says.. dads reputation is getting tarnished.. MK is not RK .. MK is MK ..he is a good guy ..tell its a lie..! Radha says cant… as he did make a mistake n its the TRUTH…!! She says sorry to RK …n says tried to hide..! She says Sultan is his step bro and she has spent her entire married life in the shadow of this truth! She tells RK to accept the truth..! RK is speechless..! RK asks why she hid it for so long? Radha asks how to tell? RK says. Radha used to tell how MK was a great guy..ideal hubby n loving dad.. but he wasnt.. ! Radha says..what to do? Cant see him broken! RK fumes that Radha lied to him always.. let him worship a wrong guy! RK asks why she din tell him before? RK says.. once Radha said..MK would have been ashamed of a son like RK .. but no he did been proud ..coz he inherited dirt in his blood! Madhu comes close to RK n RK asks to stay away saying he is a bad and filthy guy … n his dad was a bad guy too n he is that guys… n rushes to his room..! Madhu says..should have told earlier.. RK is broken..
RK comes to his room .. Madhu asks him to keep calm ..n RK picks up the rocking chair .. n is walking out when phone rings.. n Dips puts the phone on speaker.. its SULTAN! 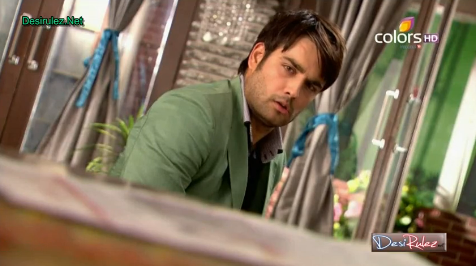 He asks .. Dard kaisa lag raha hai RK? The sting of the slap of truth not just makes the cheeks red but also marks the soul… ! Sultan says. .this truth must have made him realise his true identity..! 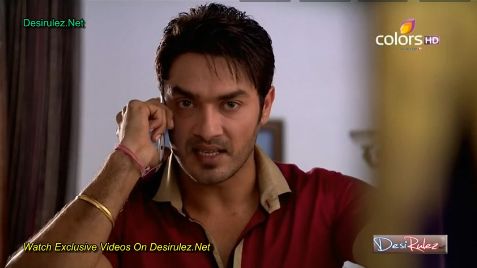 Madhu fumes n is about to pick the phone when RK stops her..! ! Din get ? Lemme explain ..! Rishabh Kundra .. ur broken .. .its only RISHAB .. the K of Kundra is GONE! Sultan says.. his dad married.. Sultans mom. .Meera first.. so before marrying Radha.. MK was married already.. so his marriage to Radha is illegal.. ! by destinys stroke..today he is RKs brother..! RK fumes.. ! Sutlan says ..for every slap ..and for every insult.. how does it feel . Mr. Rishabh ..without a surname.. how does it feel without an identity ?? Sultan asks how does it feel that Kundra is with him . n he is the illegitimate son of that same FATHER! Sultan says hated u .. a lot n u too hated me. .he fought n lost something.. n he knows what he lost.. and today he lost one battle.. n lost his all ..! Sultan says.. har gaya aaj kabhi na harne wala Rishabh Kundra.. no . .only RISHABH ..sirf RISHABH! Screen freezes on RK n Sultans faces..
Precap —- RK is burning the chair near lakeside..and is about to walk in the fire when Madhu stops him n asks ..what is he doing? Leaving her n going? Dont he dare. .n RK is teary eyed n says.. cant die..coz died a while back.! Sultan says … Haar gaya aaj.. kabhi na harne wala Rishabh Kundra.. err no .. sirf Rishabh! RK is walking out and Madhu interrupts but RK says .. to let him go else he will burn down the whole house with his inner fire! Sikky thanks God that he left.! Radha comes to Dips and slaps her! Asking her she did this? Felt good? Broke Rishu! Dips tries to explain ..but Radha interrupts..! Dips says..she din do anything! She says …she had blackmailed Radha but saw her state and her inner voice chided her.. so she kept the pic safely in the cupboard..! Dips says.. Sultan came.. n Radha was mumbling about the pic..! She says she tried to divert things but couldnt so had to tell the truth…! She says Sultan searched thru her stuff.. n so finally Dips gave Sultan the pic! Dips puts the blame on Radha saying if only she stayed quiet! 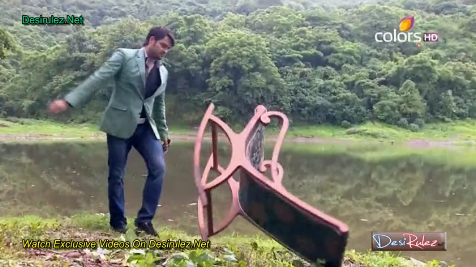 RK comes to lakeside.. and slams the chair on the ground.. ! Madhu is with him…! RK recollects his childhood moments with his dad.. drinks more n more.. then breaks the chair.. ! RK pour alcohol on it and lights it ..! Madhu rushes to RK..! 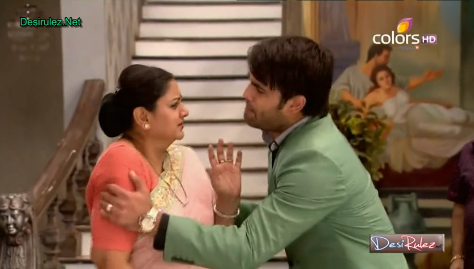 RK asks her to fold hands ..as he did Antim Sanskar of his father n Madhus father in law..! He says MK cheated them all their life.. lied to them..so he and screams.. ALVIDA Mohan Kundra.. n Bhagwan tumhari atma ko kabhi shanti na de! RK says.. now fold hands for me as today with a dead father.. his son is dead too n he pours alcohol on himself.. n Madhu asks him what is he doing? RK says.. age 28 .. reason of death.. cold blooded murder . n killer .. his dad! Madhu stops RK ..pulls him away from fire.. n says.. he is leaving her? Dont Dare…coz whether he lives or not. .she will die! RK says. .he died a while back already! Madhu says no .. n RK cries and hugs Madhu .. she hugs him back! Madhu asks RK to come back with her ..to home..! RK walks in a daze! Sikky asks Dips if she was telling truth? Dips asks what he thinks? Sikky says.. how can she be flop actress … she is superstar.. coz no ones father wuld know what a lowly and liar of a person she is..! Dips says..its Shubh Shurat.. big big blasts coming up ..! Madhu comes to RK..n asks what she can do? 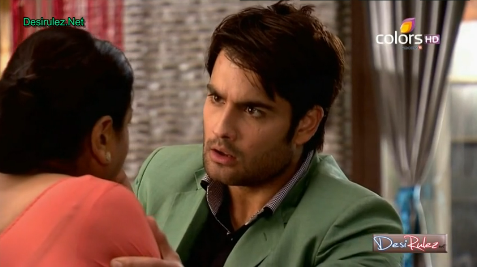 RK asks to leave him alone..! Madhu recollects Sultans words.. n fumes..! Sultan watches news about reporter asking people if they believe this news.. of RK being illegitimate? Sultan shuts the tv off and hears footsteps..! He turns. .its Madhu ..! Sultan says..he said what he had to n Madhu says..she is yet to say .. Congrats for breaking her family .. ruining her familys reputation . .breaking RK n embarassing her mom in law..! Madhu asks if he got what he wanted after taking everything from her family? Sultan turns to approach Madhu n says hate the moment when they came close for humanity n friends..! Hate the moment..when we became friends.. and letting Sultan be part of her life! Sultan says whether she was there or not.. truth would be there..! .. Sultan says with that truth he would have reached her home! Madhu says…she is of no use..! Thot he would understand! Sultan says..he came .. to talk but RK handed him to cops..! Madhu asks .. so he forcibly entered her home.. ! Sultan says n left it.. when his mom asked! Madhu asks then why today.! Madhu says . Sultan is not a guy who would break someones home to make his own! She says.. servants say ..he took care of Radha.. when she was sick..then why this? Sultan says..did what he had to..! RK doesnt understand value of relations.. so he came to help Radha! Madhu asks where is his empathy now? Where are Meera/ Aryan / Kaka? Sent them away? Coz he knows.. he is doing wrong! Sultan says not necessary to answer all her questions.. she can leave! Madhu says..he cant look away after doing all this! Madhu says..heard the phone call to RK .. the joy in the voice.. the happiness.. the stining.. the sarcasm …what was it? Sultan says.. was me.. at RKs level! Madhu says.. is this war for justice or revenge? Sultan says. .wanna destroy RK .. coz he refused to give Meera her place! Madhu asks..why punish RK? It was MK who destroyed Meera! She says.. what he wants? RKs home or surname? Only MK can give.. n he is gone! Sultan says to leave n Madhu says.. he says its fight for justice. .but he wants to destroy her hubby RK ..why? Sultan averts but Madhu keeps insisting .. ! Sultan tries to control but Madhu keeps forcing! Sultan says…its for HIM … its fight between RK and Sultan.! RK snatched.. everything from him … he has everything which belongs to Sultan.. his father. .his childhood. .his identity. .his life.. his MADHU! Precap — Sultan grabs Madhu and Madhu asks him to leave her.. n says he is hurting her..! Sultan says left u once before. .wont leave now..! Sultan extends his hand and asks Madhu to come with him ..! Madhu walks towards Sultan n then spits in his hand!